CN 557417 is a 52′ inside length combination plug + sliding door boxcar built in the mid 1970s for lumber and forest products service. It’s part of a large group of such cars (740 cars built in three orders between 1973-1974), but its paint job is one of a kind. This car was one of 4 boxcars painted by CN in 1984 as a promotion for the upcoming 1986 World’s Fair in Vancouver, BC, branded as “Expo86” by the event organizers. Each car was painted in a similar black and white scheme with 4 diagonal coloured stripes, although each of the 4 cars was in a different colour. Also painted in the Expo86 scheme was SD40-2 5334 with multi-coloured stripes (yellow, green, blue and purple). 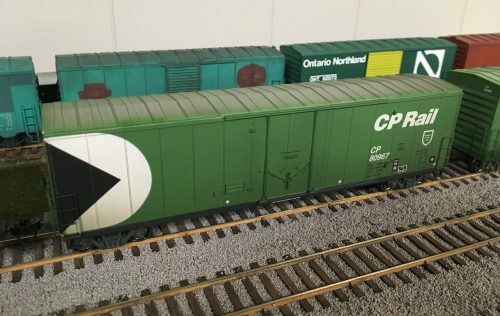 The model was built using a Kaslo Shops resin kit for a CN 52′ combo door boxcar which matches the prototype and painted and lettered using a decal set from Highball Graphics (this set appears to be now discontinued). This was a challenging paint job, requiring a lot of masking (including diagonal masking to paint the stripes) over the raised details of the car doors. Since I’m modeling 1985, the car’s paint job is still pretty fresh so the car just received a clear coat and will remain un-weathered. Eventually the car will see service on my future layout hauling lumber, plywood and other forest products from mills on the CN beyond Hearst westbound via Oba or south to the United States via Sault Ste. Marie. 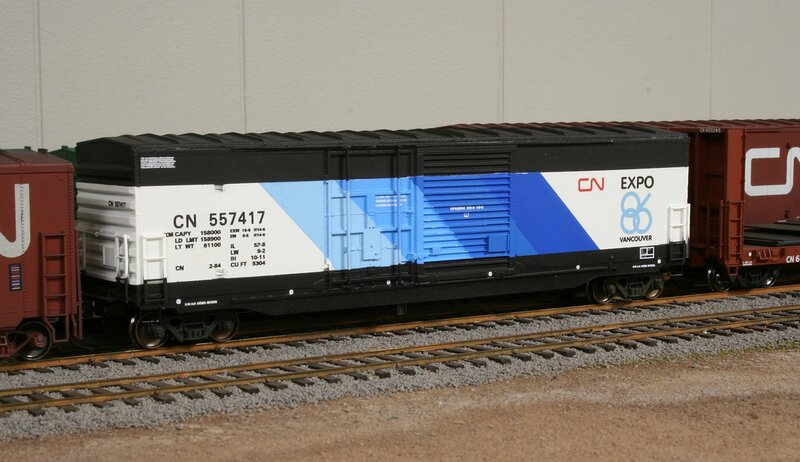 It’ll be an eye-catching change from the regular CN brown boxcars hauling paper and lumber out of the north. 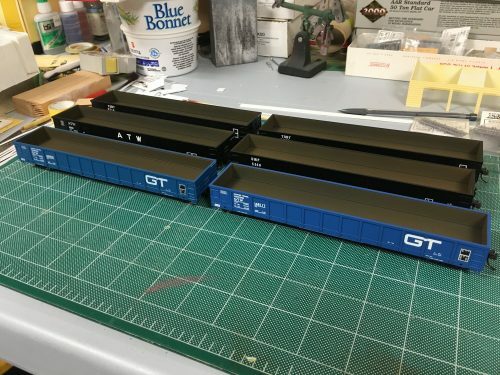 This car started out as an Athearn RTR boxcar factory decorated for the Providence & Worcester Railroad which I picked up “used”/new in box at a train show about a year ago specifically with this patch job in mind. It was weathered, patched and re-stencilled following a 1989 photo on rr-fallenflags.org. 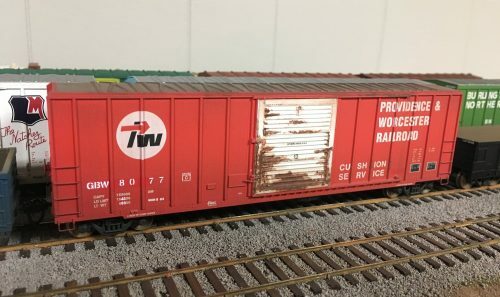 I have a certain fondness for shortline boxcars and patched out reporting marks of cars in second-hand ownership and I’ve been working on collecting a few appropriate cars from nearby US connections that can fit in to my area and era. 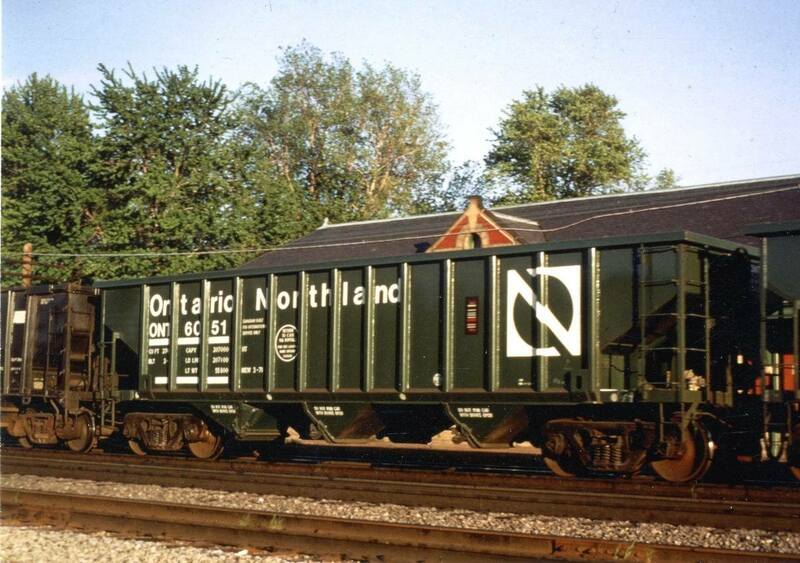 These ex-PW cars, as well as other cars from the New Orleans Public Belt (NOPB), East Camden & Highland (EACH) and Wabash Valley (WVRC) Railroads, were acquired by the Green Bay & Western in the early 1980s. Weathering was done in a few layers/stages. The body was given a general airbrush grime coat (with particular concentration along the lower edges and some vertical “wheel spray” patterns on the car ends) and the rust effects on the door were hand painted with acrylics and a fine-tipped brush. The original reporting marks were painted out with some SOO red I had on hand and new reporting marks and numbers added with Microscale stencil alphabet decals. A bit of work with pan pastels blended the rusty areas, added some streaking off the ends of the door tracks, and added light surface rust to the galvanized steel roof. A final coat of Flat Haze sealed the decals and pastel effects and slightly dulled and faded the body colour.